A friend of mine once sent a radio transceiver (transmitter and receiver) to a reputable company for repair. When he was told it was finished, he picked it up and was very pleased at how well it worked. A couple of days later, the reputable company called him and told him that they had given him a radio of the same brand and model as his, but the one they gave him belonged to another customer. Would he please return it and pick up his own, which was now repaired. He brought back the radio, and they showed him his (now repaired) radio–exactly the same brand and model. However, the price they wanted to charge him for repairing his radio was outrageously high. He told them that: a) the price was ridiculous, and b) he had done them a favor by returning the radio that had been given to him. After all, he was under no obligation to return it, and it was identical to the one he had brought in. Needless to say, that company is now out of business. However, that was years ago. Today, as near as I can tell, high-tech equipment is pre-broken at the factory. The symptoms won’t show up immediately, but definitely will be fully developed just after the warranty and/or extended protection plan expires. I call it frustrating. Manufacturers call it progress. Why, you are probably asking, am I so fascinated by radio? While the media’s use of radio, television, and social media sensationalizes and encourages controversy, argumentativeness, and even violence, I find that focusing on the technical application of physics is far more enjoyable. Back in the day, you could take things apart to see how they worked, and even try putting them back together. A mechanical alarm clock that was headed for the trash is a perfect example–all those gears. It was expected that when you tried to put it back together, there would be pieces left over, but it still gave you some idea as to how it worked–and that was without a Youtube video to explain it. Then there was the other direction–building things–anything–not huge projects, but small and interesting ones. Did you ever build (or even see) a crystal radio? A length of wire for an antenna, a second wound around a tube (such as a toilet paper tube), another wire connected to a ground—such as the center screw in an electrical outlet a galena crystal, and a set of headphones. By moving a flexible wire around the crystal, it is possible to tune in a station. In the Second World War, soldiers would build a “fox-hole” radio using a razor blade as the crystal and a pencil lead for the cat’s whisker. When I built my first crystal radio, I began to understand how a basic radio receiver works and was hooked. Could I build a smartphone? No, I cannot, but then neither can you. I do, however, have a conceptual understanding—and can explain—how the various parts of a smartphone work and how those parts are integrated. When I’ve asked my kids if they understood how theirs worked, their expression seemed to indicate wonderment as to why anyone would ever want to know. There’s hope, though, through the MAKE movement, which encourages young people–especially girls–to build, modify, and experiment. I hope they enjoy it. Al I can say is that over the years, my interest in radio and the electromagnetic spectrum has caused me to learn, but more importantly, to think. Throughout the electromagnetic spectrum, there is an inverse relationship between frequency and wavelength. We’ve already discussed frequency—how many cycles—times a signal completes a sine wave—per second. As frequency increases, the wavelength decreases. If you divide the 300 by the frequency in MHz, you can determine the bandwidth. Why 300? The speed of light—or other electromagnetic wave is about 300,000,000 meters per second, which is 300 megameters. Megahertz and Megameters—get it? It’s like comparing apples to apples. First, the wavelength of a radio signal determines several things. First, the size of the antenna. An antenna is somewhat like a guitar string, in that it must tuned to a certain frequency/wavelength to work properly. Frequencies in the 4 MHz range referred to as the 75 meter band, and a resonant antenna will ideally be about 75 meters long. On the other hand, frequencies near 145 MHz—the two-meter band, require an antenna about two meters long. Second, the different wavelengths act differently. The longer wavelengths can be used for more distant communications because the radio wave bounces off the ionosphere and back to earth, where it may bounce again. The higher frequencies/lower wavelengths can carry more information tend to work for “line of sight” communications—somewhere about 12-15 miles as the crow flies. However, if the crow is orbiting the Earth, such as in the International Space Station (ISS) or a CubeSat, line of sight straight up is much farther than 12 – 15 miles. There are other differences, but those are the most basic. Incidentally, when I speak of a 75-meter antenna, we’re not necessarily talking about its physical size. We’re actually talking about its electrical length. There are various tricks to adjust the electrical characteristics of an antenna so that it acts like a certain wavelength when it is actually physically shorter. I could go deeper into the physics, throw in some equations, and bore you to tears, but I think we all would see that as counterproductive. What aspect of the electromagnetic spectrum will I write about next? Who knows! 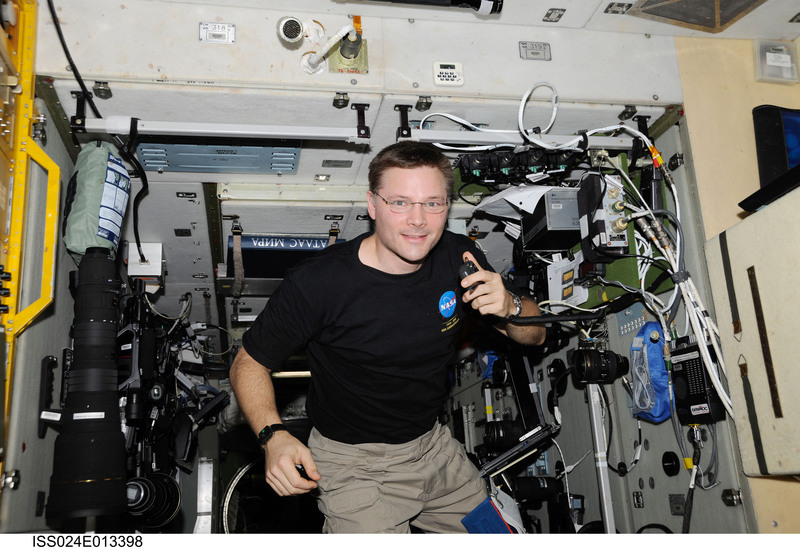 Did I mention the ISS and CubeSats? They’re both pretty interesting, in terms of radio, so maybe I’ll touch on them next. In fact, I’m fascinated by the entire electromagnetic spectrum. Some consider it overreach to include direct current, like the electricity produced by a battery, but the AC electricity that powers most homes and offices definitely belongs. AC power oscillates, changing direction and then back again in some approximation of a sine wave. There are radio waves as low as 3 – 30 Hz, referred to as “Extremely Low Frequency,” but most of us don’t notice them until somewhere around the AM Broadcast band. The spectrum continues through shortwave, or high frequency (HF), very high frequency (VHF), which includes television*, FM radio, and aircraft communication. Ultra high frequency (UHF) include a number of other radio services, including cell phones. Microwaves, which are useful for radar and reheating leftovers start around 1 gigahertz (GHz) up to about 40 GHz, are next. Going up. Next stop includes infrared through ultraviolet; smack dab in the middle is visible light. I think it’s safe to say that visible light was the first segment of the electromagnetic spectrum to which humans were aware. In fact, to many people, “spectrum” is what you see with a prism or in a rainbow. Once you get above ultraviolet, there are X-rays and Gamma Rays, which have the ability to pass through matter and create an image that can be recorded. However, they also have an additional characteristic—they become ionizing, which means that they can change the electrical charges in matter. Ionizing radiation can cause cells to mutate. While comic book storylines propose that mutations result in superpowers, that’s just a STORYline. In actuality most mutations are bad; however, bad mutations can be useful, if applied to a confined area, such as a cancerous tumor. When the cancerous cells mutate, they often die. To the best of my knowledge, the only thing above gamma rays are cosmic rays, but who knows what remains to be discovered. Don’t touch that dial. I’ll be back soon with even more. * I find it disappointing that many people do not know that with a simple indoor antenna your HD flatscreen smart television will receive the local television stations without cable. Picture quality is almost always better, because the signal doesn’t have to be compressed the way it is for cable. In addition, when television switched from analog to digital, they each ended up with three channels that fit in the same bandwidth as the old analog system. Since it’s “use it or lose it,” the other two channels tend to rely on shows that are far less expensive—so you may find Soupy Sales or Mr. Ed. Finally, since a smart TV connects to the internet through your wireless router, you can still access Netflix, Amazon, etc., all without the television being connected to the cable. Long before my time, Theodore and Milton Deutschmann started a business to cater to the new field of wireless—specifically, amateur radio. They called their business Radio Shack. Why? Ships were among the first to adopt wireless communications, and since early transmitters created a signal by generating a huge spark, there was the risk of starting a fire. To minimize risk, the radio equipment was placed on the main deck, in a separate small building, which came to be called the radio shack. Ham radio operators (no one knows for sure why they’re called “hams”) tended to call the place where their radio station was located as the radio shack, or ham shack. Amateur radio was shut down during both world wars, but hams returned to the air as soon as it was legal to do so. The end of the Second World War provided an added advantage with huge selection of inexpensively priced military surplus radio equipment. When I was a youngster, there were a few radio stores around town where you could buy components or tools. However, periodically the mailman would deliver a catalog from Lafayette, Allied, or Olsen Electronics. The Sears Christmas toy catalog couldn’t compete with these for the pure lust they generated. I remember building a set of Knight Kit walkie talkies, purchased from Allied. In the late 1960s, Allied began opening stores in malls, outcompeting most the other companies, which gradually faded away. Allied purchased Radio Shack, but the combined Allied-Radio Shack was determined to be too monopolistic, and the two companies were split up. Allied became the industrial supplier while Radio Shack stayed as the retailer in the malls. Radio Shack sold things that you couldn’t find elsewhere. The TRS-80 computer was one of the first personal computers. They introduced a pocket-sized computer and one of the first laptops. Radio Shack had a niche market—the nerds—but nerds were paying $2,500 for a radio shack computer before the general population knew personal computers existed. You could find all the parts to build a stereo from tuner to speaker wire. How about a multimeter and a soldering iron? They sold CB radios, of course, but also some ham radio transceivers. Most everything was manufactured by someone else, but carried one of Radio Shack’s brand names. If you were working on a project and need a 47 ohm resistor (usual price, 10 cents—Radio Shack price, two dollars) you could drive to the mall on a Sunday and finish your project before dinner, even on a Sunday afternoon. Yeah, their components were overpriced, but the convenience made it worth it. pencilnecks management of Radio Shack decided to sell the same products (e.g., cell phones) that you could buy for less money at Best Buy, WalMart, RiteAid, etc. I’ve been told by Radio Shack managers that the really profitable part of the store was the parts section with those overpriced resistors, capacitors, and semiconductors. You know, the ones you could buy whenever you needed them? The parts selection went from a large section of wall to a metal cabinet with multiple drawers. I think the cabinet got smaller, but in any case, there were fewer and fewer parts available. Cell phones—no problem. Parts? Sorry. I hear that Radio Shack is still sort of, kind of, in business, but you couldn’t prove it by me. The last local store is now empty. Like Bigfoot or the Loch Ness Monster, you only hear about someone who knows someone whose brother-in-law saw one. It’s too bad—they could have coasted a few more years just on what I spent there. 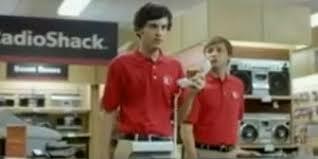 I’ve been thinking about Radio Shack’s Super Bowl commercial, in which the clerk answers the phone and tells a co-worker that the 1980s called and they want their store back. Radio Shack goes back to the beginning of the 20th century when it was aimed at ham radio operators. The term “radio shack” (vice the trademark) refers to the location of a two way radio station; in the early days of “wireless” the radio shack was a separate structure built on the deck of a ship. Since radios utilized a spark gap, it was deemed wise to keep the sparks away from flammable cargo. To this day, ham radio operators still call their operating position the radio shack, or just the shack. I thought back to the 1980s. Radio Shack had one of the best lines of computers. They sold pocket sized computers (I even wrote a book about how to use them). They had lots of electronics parts. You could buy antenna cable by the foot from a large spool. They had their own brand of ham radios. My father used to worry that I’d spend all my money at Radio Shack. Today, with a few exceptions (such as “Make” items and Arduino microcontrollers) almost everything you see at Radio Shack, you can find at other stores like Best Buy or even Walmart. I used to stop at Radio Shack, just to see what they had, and invariably bought something. I still do, but my stops occur every other month rather than every other week. So how’s that working out for them? In the late 1980s Radio Shack I believe was profitable. Its stock sold for $8.00 a share – not its highest, but certainly better than today’s $2.26 a share. Maybe they should have kept the old business model. Along with the demise of the incandescent light bulb (as mentioned yesterday) there have been other fundamental changes in technology. A century ago a radio receiver could be assembled by virtually anyone using items such as a galena crystal, and some wire wrapped around a toilet paper (or similar) tube. The only component you really needed to purchase was a set of headphones. A transmitter required a bit more – an ignition coil from a car, a tuning coil wrapped around an oatmeal box. The telegraph key was the main purchase item. Incidentally, the construction was called “breadboarding” since the parts were mounted on a piece of wood, such as the board used to cut bread. Fifty years ago you could tune your car with a set of basic tools usually twice a year. Oil and filter, set of sparkplugs and ignition points, and every so often a new set of sparkplug wires. Today most people don’t work on their own cars; they take it to a shop where (for $79) the mechanic hooks a device to the car’s computer and the computer reports what the car needs. If that clunking noise isn’t something that the computer tracks, it must not be important. Electronics – the same way. As a kid if the television wasn’t working right, I’d take the tubes out, ride my bicycle to the Rexall Drugstore, use their tube tester and purchase a replacement tube right there. Today’s devices aren’t home-repair or experimenter friendly. First, the manufacturers glue everything shut; second, there’s very little in the way of documentation. I guess I’d like to point to today’s kids and complain that they spend all their time playing video games and texting, but can’t. If there’s no 21st century equivalent of a mechanical alarm clock begging to be taken apart, just to see how it works, how can we get them excited? Kids are still naturally curious – now we have to figure out how to feed their curiosity. Hams can be found anywhere. NASA astronaut Doug Wheelock, Expedition 24 flight engineer, uses a ham radio system in the Zvezda Service Module of the International Space Station. I went to the hamfest in Virginia Beach, VA today. No, it’s not a meeting about pork products – it’s an opportunity for amateur radio operators (hams) to get together and buy or sell equipment. I like looking for “treasures” at garage sales and thrift shops, although for many, the statement “As is, no refunds” means “It’s broke and parts aren’t available.” Hamfests seem to be different. One reason is that ham radio equipment is meant to be experimented on, so repair information and parts tend to be available. Today, however, I was less inclined to buy a radio that needed repairing and more interested in tools and parts to finish up some of the projects I’ve been working on. I was successful. After getting home, I set about on some of the to-do’s that needed attention, pausing to flip on my radio. In a matter of (literally) seconds I was engaged in a short conversation with a ham radio operator in Serbia. I plan on adding a nap and then cooking out on the grill. That’s my kind of day. Decisions, those forks in the road that determine the future are always interesting. Some decisions are individual, while others are a group process. Whole books have been written about how to make good decisions, but what I find interesting is how people behave after they reach a decision. There are basically three choices. Once a decision is made, you are committed to making it work. You wonder what would have happened if you had made a different choice. (Usually after a group decision) You can be unhappy with the outcome and spend the next four years listening to talk radio.